Just how ‘independent’ from government is PHSO? If you follow the money and consider that anyone in the pay of government is not independent of government then PHSO is not independent at all. The use of the term ‘independent’ is, however, a most useful one and we can see it in action in these two recent examples. The first is part of a letter from Rob Behrens, the Ombudsman to a complainant who recently attended the PHSO Open Meeting in May 2018. He is inviting her to take part in an ‘independent’ review into the way PHSO uses clinical advice. For context, PHSO does not reveal the identity of the clinical advisor and a single anonymous opinion can override other medical expertise provided by the complainant, legal advice and hard evidence in the form of medical records and reports. However, to signify my respect for your concerns, I need to tell you that I am in the process of commissioning an independent review into the way in which PHSO commissions and uses clinical advice. It is clear that clinical advice was particularly important in the investigation relating to your father’s death, and therefore I am writing to invite you to make a submission to the independent review which is being chaired by Sir Alex Allen. Sir Alex is an independent Non-Executive member of the PHSO Board, and he will be receiving advice from a nationally known and respected clinician, whose name will be disclosed when we publish the Terms of Reference. The chair of the review will play a pivotal role in shaping the scope, deciding which evidence to include and which to discard and the final recommendations. So how independent is Sir Alex Allen? He has previously been Chairman of the Joint Intelligence Committee, an expert in keeping secrets and is currently, according to the PHSO Conflict of Interests Register, the Prime Minister’s Independent Advisor on Ministerial Interests. No doubt a paid role but it would seem this one man can serve two governors for he is also on the Non – Exec board for PHSO which is an organisation totally independent of ministerial involvement. Just how does he keep the two interests separate? In 2015 he was clearly working for the government in his failed attempt at the High Court to prevent disclosure from ministerial diaries in accordance with FOI law. The rulings are also embarrassing for the Government because the High Court concluded that evidence by the Prime Minister’s adviser on ministerial standards was “way below” what the public were “entitled to expect” of a senior civil servant. Mr Justice Charles said the testimony of Sir Alex Allan, a former chairman of the Joint Intelligence Committee, had “lacked objectivity” and should be “roundly rejected”. The judge also accused Sir Alex of demonstrating a “determination to avoid directly conceding the indefensibility of things he had said” and a “keenness to repeat generalised lines… rather than give direct answers to questions”. He said the evidence was a “reminder of the secretive culture of the public service” that the Freedom of Information Act was meant “to change for good”. So a defender of ‘the secretive culture of public service’ is put in charge of a review regarding the secretive culture of PHSO clinical advisors. Not a good omen. The Ombudsman is appointed by the Queen under the recommendation of parliament and the funding for PHSO comes directly from the treasury. It is for all intents and purposes a government paid organisation which holds government departments to account. There is an inherent bias in this arrangement compounded by the fact that parliament sets the legislation under which the Ombudsman operates, conveniently tying his hands by failing to provide ‘own initiative investigative powers’ and ‘legal powers of compliance’. The strings are firmly held by the Cabinet Office – the centre of government, who confer regularly with the Ombudsman in meetings which are not minuted or recorded in the public domain. Yet, when it suits, which is most of the time, the Ombudsman is totally independent of government in a ‘nothing to do with us’ shrug of the shoulders manner. Take this recent example from Hansard 14th June 2018. 4,000 WASPI complaints are on their way to PHSO having passed unsuccessfully through the complaints process at DWP and the Independent Case Examiner (ICE). This massive increase in complaints is due to a government decision to delay pension payments to 1950’s WASPI women and failing to give sufficient warning to allow them to make other arrangements. Many women in their early sixties are destitute as they wait a further 6 years for their expected pensions. PHSO have had a 24% cut in funding, another government decision to save money and a relocation to Manchester has seen a loss of experienced caseworkers and senior management. All the work of the Whitehall boffins, yet when PHSO have to pick up the pieces of these decisions and will quite clearly fail to do so to the satisfaction of many complainants, they are ‘totally independent of government’. How convenient. A show of clean hands all round then. Previous Previous post: Back to the future for PHSO – or is it ever decreasing circles? Next Next post: Why are the Patients Association shocked at the Gosport findings? Where are patient complainants on expert advicereview panel? in my case PHSO the ‘ top’ internal clinical advisor gave such bad advice, PHSO retracted draft , started again, came to opposite conclusion, all because commissioned my own report which led to TWO NHS patient safety alerts. Rob Behrens has refused to acknowledge this error in his review. In fact the reason is maladministration model (RB defends) of PHSO leads to ‘reasonablenesss’ justification of harmful practice which is contrary to patients safety human factors where system errors can occur requiring learning not ‘well others do it’. Lip service by RB unless proper independent review of clinical advice sought drawing on experts like HSIB, NHSI Patient Safety team and Clinical Human Factors Group. safety alerts here https://england.nhs.uk/2015/10/psa-naloxone-2/ lip service of RB here http://phsothefacts.com/a-meeting-with-mr-behrens-learning-or-lip-service/ whic raises questions for clinical advisers-who will ensure it is properly considered? Very interesting post. And I love the blog idea. Well done. I’d like to submit evidence to the ‘independent review’ but when I went to the PHSO website, this review already seems to have happened in 2016. Am confused. Can you post a link to the review here? Probably the review he did into the employment of Mick Martin, Deputy Ombudsman! Excellent exposure of the so-called “independence” of Sir Alex Allen. Independent means independent, not embroiled in the organisation that the complaint is about. BREAKING NEWS, C Grant on BBC R4- for 19 years families have identified unlawful deaths within NHS. Report out today. In those 19 years NHS managers, CCG/PCT’s covered up deaths ( alleged murders). HCC and the PHSO have each ‘investigated’ and also covered up alleged murders. The recent Williams Review April 2018 finds deaths are routinely never investigated within NHS and wishes to change the reporting deaths process. An administration tweak to still cover up alleged murder? When in public office to knowingly and deliberately cover up unlawful actions is Misconduct in Public Office- a criminal offence punishable by a prison sentence. So who has been prosecuted? No one. PHSO, according to CPS in 2018, is NOT governed by any legal sanction except for perjury ( lying to a court, or leaking state secrets. Why do MP’s trot out that PHSO is accountable? when its is not? Are we children to be reassured- or angry as adults when we expose the lies? Which just goes to show, if they will cover-up something so extreme as deaths, then they won’t bat an eyelid at cover-up anything and everything considered of a lesser significance. E.g. failures in diagnosis, follow-up care, mistakes in operations, unsafe hospital discharges, overdoses of medication etc. Parliament can’t afford PHSO to be independent…..the question is, what would it take, how can we make, Parliament change it’s mind? The PACAC committee of Members of Parliament are equally guilt of a cover up. If they really cared they would instigate procedure to change the law to Make PHSO its directors and staff accountable. Perhaps we should find a Member of Parliament to start a private members bill to make LGO and PHSO accountable . Gina Miller did it when she was up skirted !!!!!!!!!!!!!!!! You explained in a nutshell why they likely wouldn’t do it, they will only do it when it is something that affects them! Great piece of investigative blogging. As Elizabeth points out, an independent review is not carried out by a board member of the organisation whose procedures are being reviewed, even if it is a non-executive director. This is a common artifice employed by public companies attempting to hide or cover-up wrongdoing. Add to that the fact that this blog has exposed Sir Alex Allan’s previous attempt to block access to information in another role, we can be sure that he is a safe pair of hands and not the type to be critical or to rock the boat. No doubt there will be a few minor changes accompanied by a great deal of media spin and then it will be back to business as usual. Perfectly said Nicholas and always back to business as usual. 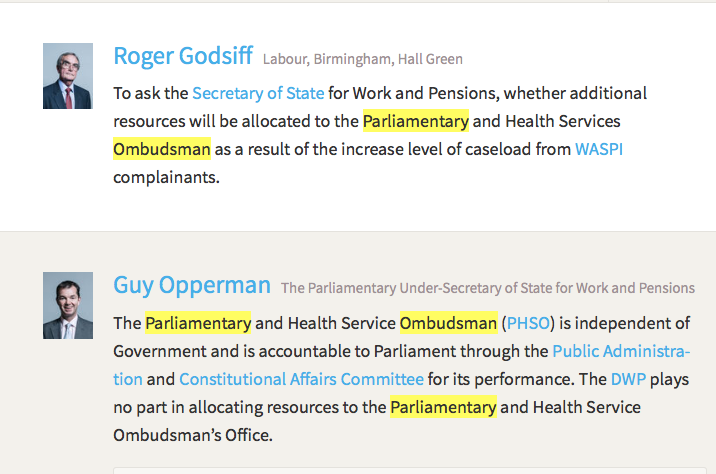 “The Ombudsman is appointed by the Queen under the recommendation of parliament and the funding for PHSO comes directly from the treasury”, and this organisation is ‘independent from Government’ ?! The 1950’s born women’s complaints to the Department of Work and Pensions regarding maladministration and mismanagement in the way the two major changes to their state pension ages were implemented will be, like all other complaints, thrown out by the DWP with an encouraging offer to go onto the Independent Complaints Examiner ( ICE), then thrown out by ICE with an encouraging offer to go on to the Parliamentary Ombudsman for the “independent” investigation. All in the system with months and now years of delay. Will this be another case of investigations dragged out, hard and provable evidence disregarded, complaints manipulated, failure denied and covered up? Meanwhile more women in their older years of life are falling into poverty, suffering ill health and anxiety from financial difficulty, stress from the arduous and unnecessarily lengthy process of complaint investigation with many dying while their complaints are still in the system. And I am at that stage now! I’m suitably tired in mind and body – the whole process has numbed me. I understand that is their remit, so in part I am able to accept what’s been purposely done to me. With rest I will be back with a vengeance. Excellent ‘investigative journalism’ as always. Let’s keep exposing their filthy lies and smoke and mirrors. It’s all self-serving, self-interest and pulling the wool over the public’s eyes. how dare they! It was interesting to read this Blog about Sir Alex Allen and that yet again he will chair another review into the PHSO. In my case the Health Care Commission named their clinical adviser, but his advice conflicted with the protocol he had written. The PHSO then could not find a clinical adviser to give advice for mine and another lady’s case, instead they asked for clinical advice for our rare conditions from an unnamed Professional Adviser who we later discovered was retired. After threatening a Judicial Review, the PHSO asked me to provide clinical advice to support our cases from the APPG on ME, the Society for Endocrinology and the then English Strategic Health Authorities. The PHSO ignored the information and do not even have a record of the complaint, and therefore missed identifying systemic failure. The Gosport scandal is the latest report on the growing number of unnecessary deaths due to the ‘cover up’ of systemic failure. Mr Behrens is aware of the situation he faces, at the Open Meeting in May he queried whether a safe space was achievable, or was the NHS too entrenched in defensiveness. Mr Behrens believes transparency is the critical ingredient for trust. He now has the opportunity to start to rebuild mine, and will either confirm the PHSO’s actions in my case constitutes serious service failure or explain why not. Parliament needs to take action to ensure the Ombudsman provides a service that will help improve all public bodies, to ensure citizens receive truth and justice. An extremely well-written piece which raises important questions about the ability of Sir Alex Allen to get to the truth. Mr Justice Charles was scathing: Sir Alex “lacked objectivity” and his evidence should be “roundly condemned”. On the point about the PHSO not providing the identity of its clinical advisors, this recent F-t T decision may be worth a read. It reveals a defect in the Information Commissioner’s current guidance – “Requests for personal data about public authority employees”.